Another day, another scam to expose. And not just ‘another scam’ but a well designed scam, one that you would least expect to find in a blacklist. That’s Freshlegend.biz for you, ladies and gentlemen. We can already figure out all the questions that are running in your mind right now and are sure you will find the answers in this article. Questions like, what is Freshlegend.biz? What does it do? Is it trustworthy? And most importantly, why such a corny name? Well. At first glance, Fresh Legend looks like a great name for an Irish whisky brand or an Australian grocery store. In reality, however, Fresh Legend Limited, also known as Freshlegend.biz, is a High Yield Investment Program (HYIP) which basically lures naive investors with sweet promises then disappears with their money. Yes, we are calling it a scam and yes, we have all the proof. But even before that, let’s first get to know the site and how it operates, shall we? First things first, Freshlegend.biz is an investment program which promises huge returns to investors while assuring them of zero risks. Simply put, you just deposit some money into your Freshlegend.biz account and wait for the checks. Sounds good, right? Fresh Legend accepts deposits in ordinary cash or Bitcoin. Withdrawals are processed, and accessed in form of the currency used when depositing. Some of the means available to account holders for deposits and withdrawals include popular e-wallets such as Payeer, Perfect Money and AdCash. Deposits and withdrawals involving Bitcoin can be completed using any legit Bitcoin wallet subject to keying in the correct address of your Freshlegend.biz account. Freshlegend.biz is formally registered as a private limited company under the name Fresh Legend Limited in the UK with the license number 10739499. The certificate of incorporation shown on the site shows that the company headquarters are located in Cardiff, Wales. Another thing, the site hasn’t been in existence for 8 years as shamelessly alleged in promotional material – it’s not even a year old. The certificate of incorporation clearly shows the date of registration as 25th April 2017 which means that whoever wrote the main page lied and/or was too stupid to note the date on the certificate. Or both. 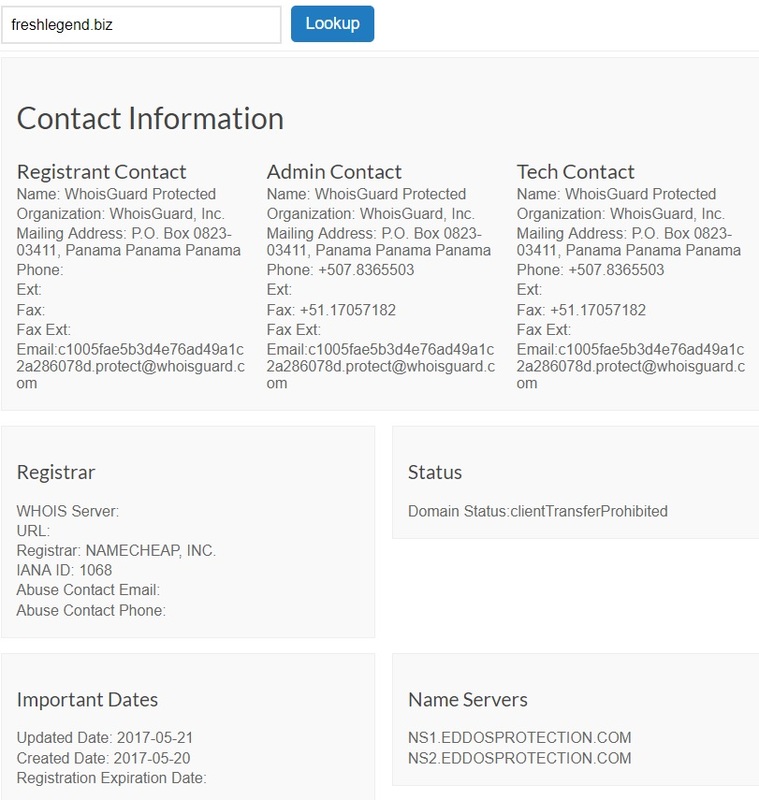 The domain freshlegend.biz itself was created in May 20, 2017 as can be seen in the above image. Notice also how the identity of the creators of the site is hidden by a privacy service. Clearly, these people want to remain anonymous. Apparently, Freshlegend.biz is a leading investor in global financial markets and takes advantage of the large pool of funds availed by their investors to trade in various assets and thereby make huge profits. The site claims to employ hundreds of staff, among them expert traders to ensure constant returns. As is the norm with HYIPs, they do not give the names of the exact markets and/or assets they trade in. Plan 1 – Pays a 15% ROI hourly for 10 hours. Plan 2 – Pays a one-off ROI of 210% at the end of a day. Plan 3 – Pays a on-off ROI of 500% in 3 days. Plan 4 – Pays 2500% ROI in 10 days. Plan 5 – Guarantees 8888% in returns in 30 days. Withdrawals can be made through personal Bitcoin wallets or e-wallets such as Payeer, AdvancedCash and Perfect Money. As it turns out, Freshlegend.biz does not allow bank transfers which is very convenient for them as it makes it very hard to track them when they disappear with your money. Under the lens: is Freshlegend.biz a Scam? What kind of money making business is the site involved in? Freshlegend.biz allegedly generates revenue from buying and selling stocks and options in different markets. It also partakes in mining and selling Bitcoins. Of course none of these claims have been substantiated using reasonable proof. Does the site promise too high returns? Yes. Freshlegend.biz promises returns of up to 8888% which are too high for ordinary investments taking into consideration the risks and uncertainties of financial trading. This is very typical of scam sites and Ponzi schemes. Is the site run by real people? Not really. On the About Us page, there are a number of ’employees’ listed with their names and positions indicated together with their pictures. One of these employees is the alleged CEO, John Doe. We found out that the image passed off as him is actually a stock image purchased from shutterstock.com, and has been used in various other websites before. So of course the site is run by real people, but definitely not the ones shown to us. Is the site legally registered? Does it have a physical address? As stated earlier, Freshlegend.biz is legally registered in the UK as a private limited company although we couldn’t certify the validity of the provided certificate. The site’s headquarters are said to be in Cardiff, Wales and there’s no exact location provided. Red flag right there. Freshlegend.biz has been in operation since April 2017 which makes it only a few months old. On average, sites that have been in existence for more than 6 months are relatively more trustworthy than those that have been there for less. In this case, we cannot pass off Freshlegend.biz as trustworthy or credible until after 6 months and we are very sure that it won’t be around by then. How popular is Fresh Legend? Surprisingly, Fresh Legend is quite popular. At the time of writing the Alexa.com global rank of freshlegend.biz was 227,948. Almost a third of their traffic comes from Pakistan. Other significant sources of traffic include Bangladesh, Ukraine, Ghana and Russia. As you can see, Freshlegend.biz underperformed in our scam test which, coupled with the many red flags we noted in the review, leads us to label it a scam. Anyone who has ever come across, or been a victim of a Ponzi scam can tell that Freshlegend.biz has all the makings of one, starting with the very high ROIs they promise. Please avoid this scam for your own good. Verdit: Fresh Legend is a SCAM! If you have been scammed by Fresh Legend, please let us know by commenting below.